Have your tot dressing like everyone’s favorite villain with this toddler Darth Vader costume. The black romper is made of comfortable polyester and flannel while Vader’s suit controls are printed on the front. There are snaps lined behind the legs for easy access diaper changes. In addition, the costume comes with a detachable cape and fabric headpiece. It will be impossible for your toddler not to look simply adorable in this Darth Vader costume. 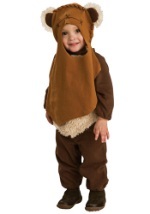 See our other toddler Star Wars costumes to create a cute day care or play group Star Wars costume!